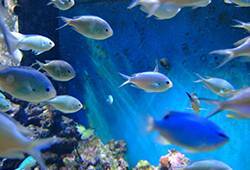 Add a bit of life to your room with an aquarium fish tank. These modern aquarium tanks create a tranquil atmosphere in your office, reception or home. With a massive 300L capacity there’s plenty of room for everyone and they’re suitable for tropical, saltwater or freshwater marine life. So whether you’re looking to upgrade your fish tank and keep those fishy friends happy or bring a bit of life to that dull waiting room – these tank and cabinet sets are perfect! There’s plenty of storage space underneath the tank, with a two cupboard cabinet to store stationary, fish keeping accessories and much more. Delivery is free to mainland UK (excluding Scottish Highlands) or why not get it even quicker and collect it from our warehouse in York, North Yorkshire.